March 2013 | GIS and Remote Sensing Tools, Tips and more .. The LDCM/LandSat 8, which is launched from Vandenberg Air Force Base on February 11, 2013 is started to send Earth’s picture to the ground from the space. This week, the Landsat Data Continuity Mission (LDCM) released its first images of Earth, collected at 1:40 p.m. EDT on March 18.LDCM is performing as planned and everything is on track for a May operational transition. LDCM is a joint mission of NASA and the Department of Interior's U.S. Geological Survey. 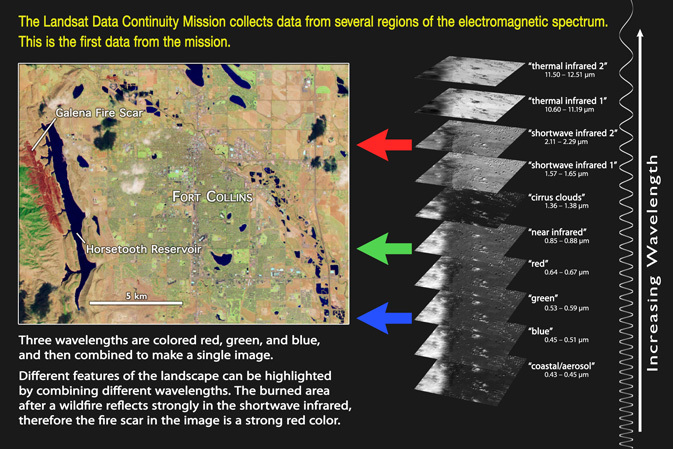 According to NASA website, LDCM’s first instrument, Operational Land Imager, or OLI instrument, that took the natural color image. The natural color image showed the landscape in the colors our eyes would see, but Landsat sensors also have the ability to see wavelengths of light that our eyes cannot see. LDCM sees eleven bands within the electromagnetic spectrum, the range of wavelengths of light. OLI collects light reflected from Earth's surface in nine of these bands. Wavelengths on the shorter side include the visible blue, green, and red bands. Wavelengths on the longer side include the near infrared and shortwave infrared. LDCM's second instrument, the Thermal InfraredSensor (TIRS) detects light emitted from the surface in two even longer wavelengths called the thermal infrared. The intensity of the emitted light at the longer wavelengths measured by TIRS is a function of surface temperature.